Thoughts on faith, life, and things that spark my interest. Rules are necessary for any group of people to function effectively. We agree to rules or laws of behavior so that everyone benefits. Most of the time the laws are fair and just. Sometimes the laws are designed to exclude people. There were laws that sought to exclude African-Americans from voting. There are rules about primaries in my state, Virginia, that some would say exclude candidates. There are rules that exclude women. It is much easier to look at laws and rules of others and judge them to be just or unjust. It is much more difficult to look at our own rules to decide if they are just or unjust. We don’t like admitting that we may be unfair, unkind, or unjust. Yet, we are called to self-examination, especially during the season of Lent. We are called to look at our own lives to decide if the rules we have created for ourselves are unjust. One area of rules is around the clothing of others. We have a rules about what should be worn at particular times and places. If someone is dressed in a way that does not follow our rules, then we often treat that person differently. We do not welcome them into our circle, our church, or our lives. We say that they must dress according to our rules to be accepted. I remember overhearing a conversation between two members of the same church about this. Guests had shown up to their church wearing clothing that was against the rules. These two church members did not feel that these people who did not follow the rules should be allowed to come if they did not follow the rules. They were seeking to exclude and not include people in the community of faith. Then I recently heard someone talking about one of my own pet peeves about the rules of dress. I have a rule about wearing pants. Pants should be worn at hip level, and underwear should be under the pants. This applies to men and women. I have seen both sexes exposing their underwear over very low pants. If I exclude the low pant people, then what does that say about me? If I exclude those who do not follow my rules, then I am failing to be as loving as God calls me to be. If I exclude low pant people from worship, then I am no better than the folks who were talking about guests at their church. Just because someone’s form of dress does not agree with my rules about dress does not mean that the person is not created in the image of God. Just because their rules do not agree with my rules does not mean that they should not have a welcome invitation into God’s presence . I invite you to consider where and how you are excluding others and how you might be more welcoming to others. Do you have rules that exclude others from your life, form the life of the faith community, or from the presence of God? Boots are on my Christmas list. They have been for a few years now. I want cowgirl boots. I like footwear in general, but the boots will be a statement piece. They speak of my love of bull riding. I often observe what footwear other people are wearing. Recently, I was at a meeting. It was my first time in the group. I looked around at the people. I noticed that many were wearing boots. These were mostly farm families. These boots were not fashion statements. These were boots that were practical. These folks needed their boots. 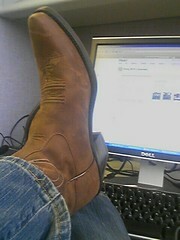 I just like cowgirl boots. Sometimes we forget the difference between what something looks like and what is needed. We get caught up in appearances rather than remembering what is needed. We want pretty pictures, but we forget that the experience is more important than capturing the picture. The experience of living is much more important than the appearance of living. In this season of gatherings of family and friends, are you interested in the appearance or the experience? Do you want everyone to look happy and smile pretty, or do you want to experience love and acceptance? Clothes define the man, at least according to the old saying. Most of do put a lot of consideration into what we wear. We seek to make a statement, to fit in, to be in style, to be fashion forward, to define our personality, to placate parents, to be presentable, to conform to our peer group, or just be comfortable. There are lots of reasons we choose the clothes we do, and very few of those reasons have to do with practicality. We want to be noticed. We want to be accepted. We want something more than just warmth or cover for our bodies. Many are getting a chance to support a cause through their clothing. The PBR, Professional Bull Riders, and Wrangler have a new campaign, Tough Enough to Wear Pink. Starting this weekend, the PBR is encouraging all fans, staff, and athletes to wear pink. Bull riders, who have an image of being tough and rugged, and now they are being invited to wear a color that often has been used to designate femininity. The “girly” color for the cowboys. I have pictures of my favorite bull riders in pink chaps. This may not come to pass, but the image made me laugh. This idea of what we wear started me thinking about what all of us wear. Not just our shoes and clothing, but our expressions show something to the world. Is that something that you want to be showing? What do you want to say to the world? Do you want to say that you are not interested in them or their opinions, or do you want to say that you care about others? Do you want to keep your head down and eyes averted to say that you have little worth, or do you want to look at others directly allowing them to see that you are a person of value? What we wear matters. It makes a statement about what we think of ourselves and others. This weekend, I’ll be looking for pink jeans and chaps on the bull riders. What are you wearing? Every season we see new fashion trends. There are the season’s hottest colors, a change in hemlines. It may be a season for ultra-feminine fashions, form fitting, or any other possible trend. We have seen skinny jeans and wide-legged pants. It is interesting to watch. Some of these styles look good on many body types. Some styles can be modified to look good on most body types. Some styles can only be worn by only a very select group of people with very specific body styles. Every style does not work with every body type. Yet many will follow a style trend because it is popular, because their friends are wearing a particular style, or because they believe they should always stay current with the trends. Sometimes the latest fashion trend is not a good choice for an individual because it does not flatter that individual. For example, very wide-legged trousers can make petite women seem even smaller. The clothes overwhelm the individual. There are lots of trends in fashion and in life. These trends do not always fit our body types, our personalities, or our values. We have to find the right fit for us, not just go along with the current trend. We have to consider what is the best fit for who we are. We are each uniquely created in the image of God. Some of us are shorter than others. Some of us are more angular. Some of us are more rounded that others. Some of us are trying to de-emphasize a physical feature. Some of us are trying to emphasize another physical feature. We are each a unique creation. Instead of forcing ourselves to wear the latest thing, lets try to find the best thing for us. So, what are you wearing? photo © 2006 Daniel Lobo | more info (via: Wylio)It used to be that air travel was an event. It was a celebration that required dressing up. We have grown consistently more casual in our dress for most of life, but I was recently at the Dulles International Airport. As I began walking in, I noticed a gentleman who was dressed up. I thought about how he was making an event. Well, it turns he works at the airport. I saw several other people dressed in a similar fashion. Each of these gentlemen made eye contact and wished me a good day. In a place where I remove my belt and shoes and put them back on with complete strangers, it was nice to have someone willing to make eye contact. In a place where individuals rarely seem to make interpersonal connections, it was comforting to have someone speak to me. The uniforms gave an air of importance to not only the event of flying, but it also made me feel less like a part of the huddled masses being herded through security. I felt valued. We all want to feel valued, significant, and respected. Consider what you wear and what it says about you and your opinions of those around you. Do you always wear your absolute worst at home because it is only your family who sees you? Do you take the time to make eye contact with those in your household, or are you too busy with chores and activities to look at them? It is probably not very practical. To wear evening clothes to do household chores, but it won’t hurt to at least brush your hair before starting a household task. Taking some care in our appearance shows that we value the people around us as well as ourselves. So, what are you wearing? photo © 2009 Emilio Labrador | more info (via: Wylio)A large part of bull riding is the image of the bull rider. They are the iconic cowboy image. They are the a living embodiments of the real cowboys who lived by a code of honor and braved the wild frontier. They tip their hats to the crowd. They seem to be fearless. Often they look very similar in their appearances. Wearing a long sleeve “cowboy” shirt, jeans, boots, cowboy hat, and riding vest many of the bull riders look very similar to one another. Yet, their personality and flair come out especially in one apparel item. Yep, it is the chaps that show personality, style, and individualism. The chaps seem to be one-of-a-kind creations that shout to the world a rider’s identity. Some proclaim faith with crosses emblazoned on the thighs. Some proclaim a flair for the dramatic with zebra stripes. The chaps are a statement of that while the person riding them may be a part of the larger group of cowboys, he is most definitely his own person. He may have lots of fringe or relatively simple chaps, but they are his statement piece. Most of us don’t wear chaps. We don’t have as obvious statement pieces that state our identity to the world. So, if you are not wearing chaps, how do you proclaim yourself to the world? How do you show the world who you are, what you believe, and celebrate your uniqueness? If you don’t have something like chaps, then what are you wearing that defines you? Each of us, chap-wearing and non-chap-wearing, are created in the image of God. We are wonderfully and uniquely made. Our personality, flair, and passions define us. Share with the world your self, knowing that you are adding brilliance to the world around you. So, what are you wearing? As I slipped my “standing orders” card into my wallet for the first time, I started thinking about how the various things in our wallet identify who we are, what is important to us, and our personal preferences. The “standing orders” card means that I now bypass general registration for lab work. I will just go straight back to the lab for a lab procedure that needs to be done every couple of months. Nestled in my wallet, the card joins my insurance card, credit cards, debit card, driver’s license, and business cards. There is also money, membership cards, and coupons. It is probably a normal wallet with no real surprises, but it does tell you who I am. It tells you my contact information, my occupation, and the memberships I hold. It tells you that I like Starbucks coffee, have purchased and returned items at a local department store, and hope the fortune from my fortune cookie will come to fruition. Our wallet not only identifies us, but it also defines us. Consider what is in your wallet. How are you defined by what you find there? Is this how you want to be defined, or would you rather be considered differently? Perhaps this is where we can begin to make changes in our lives. As we feel called or compelled to seek the vision God has created for our lives, we must stop and ask ourselves how the lives we are living match the vision before us. For example, we may have a vision of a peaceful family life where the family enjoys regular dinners together. However, if we are never home for dinner, then our vision has no chance of becoming a reality. If our vision is to be free of debt, then our wallet filled with lots and lots of credit cards does not align with that vision. If our vision is to be better organized, but we shove money and credit cards indiscriminately into our wallets, then our wallets our not in tune with our vision. Maybe that wallet we carry most places with us is the beginning to changing for where we are to where God is calling us to be. The new “standing orders” card is a part of my vision to honor God more fully by caring for my health. What’s in your wallet?